There is something to be said for having a high level of fitness. It really allows you to do things that most people couldn’t even contemplate doing. This weekend was a celebration of my accumulated fitness. I was able to swim, bike and run with apparent ease over large distances and felt great while doing so. The weekend started out with a bike ride with my friend Todd and a bunch of guys from the Prospect Park Peloton. We met at the Brooklyn Bridge at 7:45am for a ride up to Nyack. It was an interesting and challenging ride. After riding over the Brooklyn Bridge we rode all the way up the West Side Greenway until we passed under the George Washington Bridge. I never rode up this was so far and taking this route was an experience. It passes through some interesting urban landscape. I wished I could have asked the peloton to stop on several occasions so I could have taken a couple of pictures. Once over the GWB, we took the back roads and hit all of the hilliest sections. It made for a challenging and satisfying ride. We stopped at the coffee shop in Nyack and took about a 30 minute break to have a snack and grab a drink. On the way back we had lost one of our members. When this was realized, we all stopped on the side of the road in the hopes that he would catch up. After 5 minutes had passed, we came to the conclusion that one or all of us should go back and look for him. Questions were asked as to whether that was ok and if anyone one wanted to continue on. I think a few of us wanted to go, but none of us really wanted to leave someone behind. I mentioned that I needed to be home by a certain time, but would wait, since if it was me who was left behind I would want someone to wait of come look for me. No sooner had I said this, I discovered that my front tire was flattening out. A couple of guys helped me changed it. It was like having my own Nascar pit crew. We got it fixed within a few minutes of the return of the guy who had dropped behind. We had no other delays on the way home and I made it back home with time to spare. I was very glad I did this ride. I don’t think I could have handled a 50 mile ride by myself in Prospect Park. The 78 miles I road with the Peloton was so much better in terms of the company, quality and quantity. Today I met my friend Rob for a return run to Coney Island. We met at 5am in order to make it to the beach in time for the first annual Cibbows Breezy Point race. We ran a slow 6.5 miles in the darkness, but had the rising sun coming up ahead of us as we reached the beach. As we approached it, we could tell that it was going to be windy on the water and figured on heavy surf. This proved to be the case and many of the swimmers were wondering if it was going to get very bad in the water. The original race plan was to swim towards Breezy Point to a buoy just off shore. Once there, you would either turn around and head back to the start or board a boat if you were going only one way. What happened though was that we were all instructed to just head to the beach on Breezy Point. For some reason they wanted to get all of the swimmers out of the water. It wasn’t actually a mystery why. Once you were past the half way point in the channel the wave would break over you from behind with regular and fairly intense frequency. It was just about impossible to sight because of the heavy seas and the swimmers were all spread out as they got caught in the various currents. When I was informed that I should head to the shore, I had just started thinking that I would be lucky to not be pulled out of the water on the return trip. I didn’t see how I would be able to make it back in the allotted time when it was taking so long for just the way out. I think most everyone was happy and relieved to be to have the race end on the beach. For me, it was the best of all possible outcomes, since I really wanted to land on the beach and was a bit disappointed in the race when I found out that a beach landing wasn’t one of the elements. So landing on the beach absolutely made my day and the fact that I didn’t have to make the return swim wasn’t so bad either. On the beach I had a surreal shipwrecked kind of feeling. 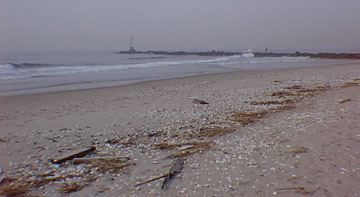 Dozens of swimmers were stranded on the beach awaiting “rescue” from the various support boats. Everyone was in good humor and laughing at the situation. Some of us got rides back on the boats, while several others got a Jet Ski ride back. It was fun hanging out on the beach and relaxing in the sun. The boats returned us to the docks at Kingsborough Community College and from there we were driven back by people shuttling the return swimmers in cars. It was all so much fun. Back at the start/finish a small band was playing and there was plenty of food and stuff to drink. Rob and I hung out for a while talking to various people. The race director announced that there was one official finisher, a woman named Laurie that I swim with at CI regularly. To complete the day’s workout, Rob and I decided to run back home. My legs were feeling great and I was setting a pace that Rob couldn’t keep. Rob told me to go after about 1.5 miles, so I headed out and began to push my pace. I was running with ease despite being weighed down by a backpack with thin rope straps digging into my shoulders. By the time I returned home, it had gotten quite warm and sunny. I felt as if I was bursting into flames when I walked through the door and quickly headed for a cold shower. Even though I sprayed myself with cold water for about 10 minutes, I was still sweating profusely when I came out of the shower. It took about another 30 minutes before my body finally cooled down. Overall a very satisfying weekend of workouts.